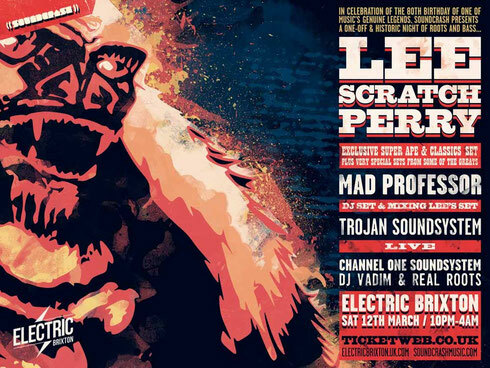 Soundcrash presents a one-off, historic night of roots and bass at Electric Brixton on Saturday 12 March 2016. Starring producer Lee Scratch Perry with special guests including Mad Professor, Trojan Sound System (live), Channel One Soundsystem, and DJ Vadim & Real Roots, the show is also in celebration of the pioneering Lee Scratch Perry’s 80th birthday. The Soundcrash event explores the history of roots reggae and bass with Lee presenting his 1976 album ‘Super Ape’, with Mad Professor also mixing Lee’s set. The album, which apparently remains an all-time reggae/dub classic, was reissued in 2013 for World Record Day. Grammy winning Jamaican music producer Perry was one of the pioneers of dub music, cutting his teeth at Coxsone Dodd’s Studio One hit factory with his early adoption of effects and remixes to create new instrumental or vocal versions of existing reggae tracks. Lee’s band The Upsetters also had notable success, including ska classic ‘Return Of Django’ on Trojan Records. Amongst the greats Perry has worked with are Bob Marley and the Wailers, Junior Murvin, The Congos, Max Romeo, The Beastie Boys, Keith Richards, George Clinton and Adrian Sherwood. A biopic, The Upsetter: The Life and Music of Lee Scratch Perry, which was narrated by Academy Award winner Benicio Del Toro, was released in 2011.